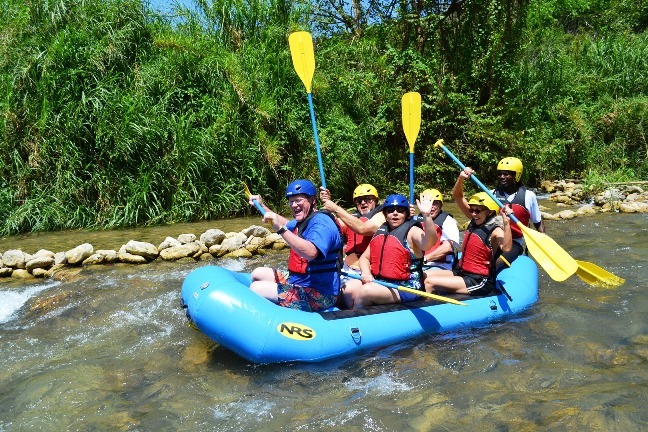 Your Falmouth rafting adventure begins with a 20-minute scenic drive to the historic Rio Bueno River where you will have a short safety briefing and training exercise. Next, take a walk across the swaying jungle bridge for a short hike through the cool rainforest to the starting point of your water rafting trip down the historic river. With your co-captain, and tour guide steering the rear of the raft, paddle boldly through the twists and turns of rushing water rapids to the midway stop where you can swim and swing on the rope into the clear placid river pool. 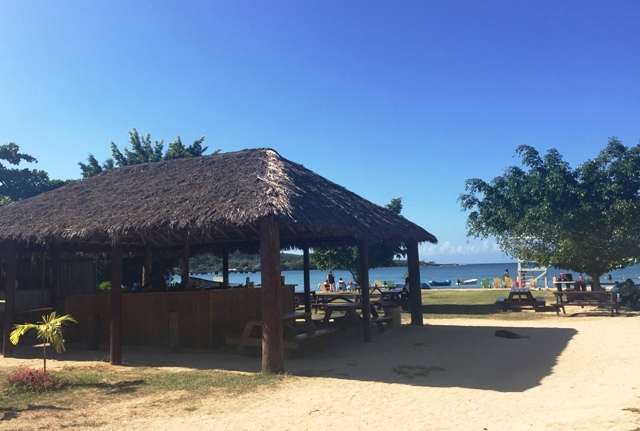 After your stop, climb back into your raft and continue floating through lush tropical greenery while taking in the amazing scenery as you float down river into the Caribbean Sea. From there you can get pulled by motorized boat (weather permitting) or take a short walk along the shoreline as the sand hugs your feet and caresses your toes before arriving at the Bengal Beach; have a cool refreshing drink at the bamboo bar, take a swim in the warm ocean water, relax on the beach or journey on a short drive to the historic site where Christopher Columbus first landed in Discovery Bay. Tour the open air museum before a short but informative sightseeing drive through Historic Falmouth on your return. The Rafting portion of your tour lasts approximately 1-hour, depending on the river current and time you spend at the midway stop. This tour is guided, with two to three guides leading small groups of people. 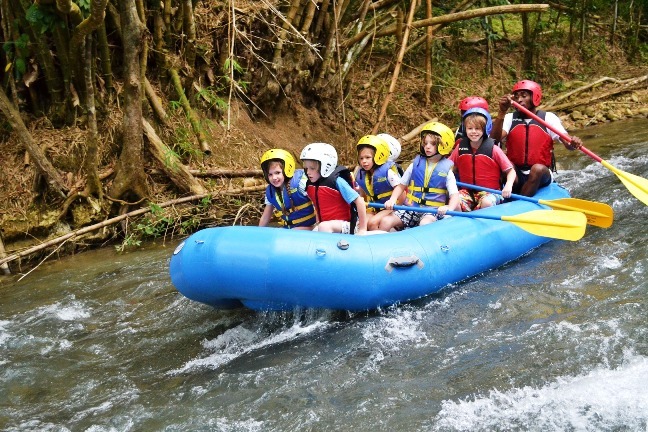 * Falmouth Water Rafting begins at the same time as Kayaking, River Boarding and Tubing so individual members of a family or group can choose different activities and go down the river together. •	Fun for the entire family! * If rates are not posted, please contact us! We had a wonderful excursion. Both the driver, Clinton and our guide, Alex, were fantastic! They were professional, informative and helpful. We truly enjoyed our trip. We were very pleasantly surprised that our driver was to stay with us all day. The rafting was terrific, we all really enjoyed the raft trip, and would highly recommend the trip on the Martha Brae. We were all just OK with the beach (we live at a very nice beach), so, because we had the use of the driver, we decided to do some other things. Our driver (Steve) was wonderful, he did several things extra that we all really appreciated. I thought the web site was easy to use and understand. Wow, just wow! We had a great time, and the guides were outstanding, especially Errol. 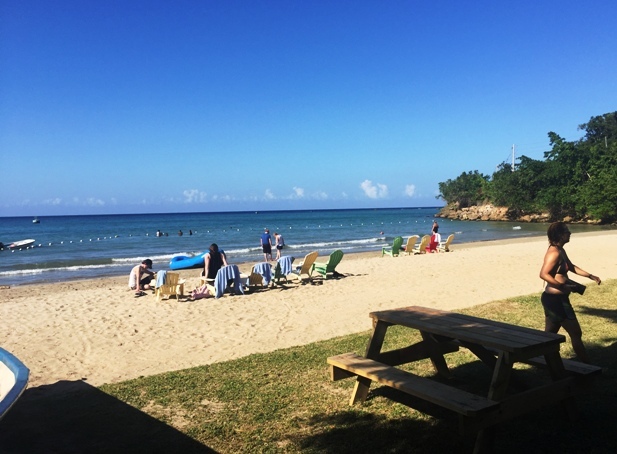 We’ve been to Jamaica several times, and this was the first time we felt safe, really saw the beauty of the island, and loved the rafting trip. The only negative was that 2 of our party couldn’t go because of last minute illness, and we were still charged for them. Wow, just wow! We had a great time, and the guides were outstanding, especially Errol. 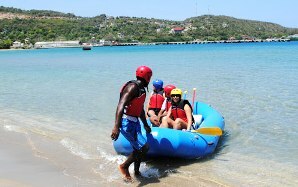 We’ve been to Jamaica several times, and this was the first time we felt safe, really saw the beauty of the island, and loved the rafting trip. The four of us had a great time. The staff was very pleasant and very knowledgeable. Our driver was superb, taking us to lunch and showing us some additional sights. The rafting was fun and very refreshing. The whole day was a fantastic way to enjoy the island. The value was exceptional compared to other activities available to cruise lines. I highly recommend this excursion! We had a wonderful time on the excursion. Our guide was great. (I think his name was something like Brenton). He even dove in the water below the falls until he found the prescription sunglasses one of our group dropped, and this took several minutes. We all wished that there had been a little more time rafting, but all in all we had a very nice day. The rafting was fun. The guides were very friendly. 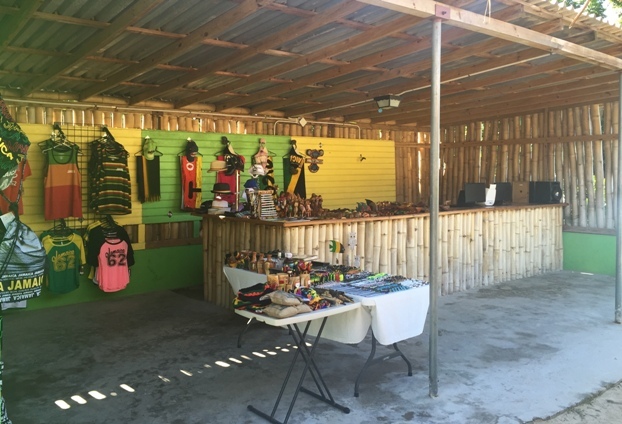 Our driver gave us a lot of information about Jamaica which we appreciate. It was a great experience. We brought backpacks for the children. What can I say when we first walk into our resort lobby we find our driver/guide Paul. Let me say the trip advisors and yelp reviews of this man don't lie he's amazing and if you can request him in advance please do so! We got lucky I read about him but I didn't know how to request him. So I just hope that we would get a good guide when he said his name I said and OMG I read about him and people rave about how awesome he is and that wasn't a lie. As we started off our trip Paul took the time to explain the history about Jamaica. Which into that point didn't know what a rich history it had. our first spot way was look at point and Paul want to make sure that we got some good pictures to take back home. He even told us that if we saw anything along the way just let him know and he would stop for us. The spot wasn't planned but he felt was important that we saw was Columbus Discovery Point which was so beautiful he explain the history and let us walk around for pictures. As we start to wonder around my friend got a little side track a went off the path. Paul notice right a way that she was off track and local street vendor was walking her near wall saying he could take her picture. Paul quickly made it known to the man that he was right there and made sure that she was safe and didn't get push into buying anything she wasn't ready for yet. Paul explain in the car that he wouldn't leave us alone to get harm and we would watch over us but it was important to watch ourselves and not put our self in harms way. We so travel down to the river at first when got there the one was there and Paul quickly call his boss he reassure us that if this active wasn't going to run for some reason that the would make sure he got a second action plan for us. We was quickly working away on figuring things when the people finally showed up. He took care of all the admission stuff and even kept our item safety lock in the car. When we were about to start of walk to the river he told his that he would meet us down at the beach were the active would end. The White Water Rafting was awesome a bit different what we have in the states but super peaceful. Our guide he took us on a small water fall hike and we got to see the farming land and jump off a pallet form. I was awesome along the we got more history of the land and people it was great. At the end we find Paul right were he said he would be it was great! Thank you Paul and Jaital for a great trip! Very good experience, the best of our vacation. You guys are awesome, excellent service –no complaints. 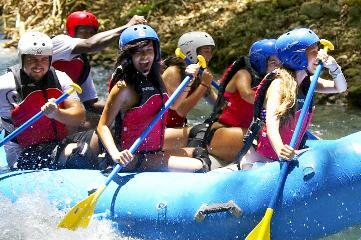 The rafting adventure was awesine, the best part of our vacation. Both, our driver and our guide were super nice, going the extra mile for us to enjoy the tour. We enjoyed our excursion but would have like it more if the guide had shared information about the landscape, fish and animals, plants, etc while we were on the raft. Our trip on December 8, 2015 was wonderful. We really enjoyed our guide,he was such a wonderful guide. We really appreciated the time he took to make our excursion so special by bringing us up the waterfalls prior to our rafting and beach day. That was actually the highlight of the trip for me. We also sang Bob Marley songs together along the trip down the river. That was really fun. I felt like he really went above and beyond to make sure we had a great time. You are very lucky to have him. Our driver was also amazing. He got us there safely, and was very informative and helpful. He waited patiently for us to end our beach day, and made sure he pointed out some cultural things along our drive and told us a lot about the history of the area which was really great. We really enjoyed our trip, and we were glad we chose it! Keep up the great work! We really enjoyed our trip. Both the driver and the guides were great. Thank you! We had such a wonderful time! Our group was a group of 14 ranging in age from 7yo-74yo and we all had an amazing time-our white water rafting trip was a highlight of our vacation. Our guides were awesome! Our Day trip with you was Incredible! Andre was an exceptional guide! The driver was on time , everyone was friendly, and I felt very well taken cared of. I WILL BE SURE TO RECOMMEND YOU! 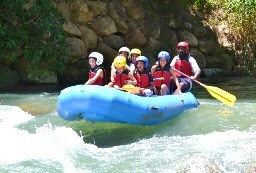 We had a great experience in Jamaica with the White Water Rafting and Beach Adventure. Right from the start meeting our driver, Kadeth, at the cruise ship terminal we were impressed with the professionalism and friendly approach displayed by the Jaital team. The rafting was very relaxing and well organised. We felt like we were in good hands the entire way. Kadeth really made the day special for us. She was very knowledgeable about Jamaica and was happy to answer all our questions and share her experience. She really looked after us and went out of her way to make the day enjoyable. Getting back to the cruise ship it was apparent that many people don’t even leave the terminal compound which is a real shame. We felt like we got to experience just a little part of real Jamaica and meet some wonderful people along the way. We would highly recommend the team at Jaital and hope to use Jaital again in the future. We had a great time. My 4 year old grandaughter says, \"I just love river rafting.\". Fredrick was our guide and he was great. He gave us lots of wonderful information about the trees and plants and he added a lot of fun, plus kept us all very safe. We had a great time on the White Water Rafting tour! The tour guide (Andrew) was very cheerful and he told us a great deal of Jamaican facts, which made our rides back and from the tour very interesting. Thank you so much! I am happy to report that we were pleased with every aspect of our experience – from initial booking , changes to booking, meeting our guide, the trip itself, and all of the people we encountered along the way. Everything ran perfectly!